During World War II, the United Kingdom was facing some serious attacks from the sky, and to help minimize the damage done by the Luftwaffe, British engineer Guy Maunsell developed a clever strategy: take to the sea. Though now defunct, these incredible concrete monsters are still standing out at sea, impressive as ever. One of the forts still remaining—Red Sands Army Fort—sits rusting off the coast of England's Herne Bay. Built on land before being floated out to sea in 1943, the septet of towers were once connected by walkways and boasted an arsenal of anti-aircraft cannons for taking down airborne enemies. 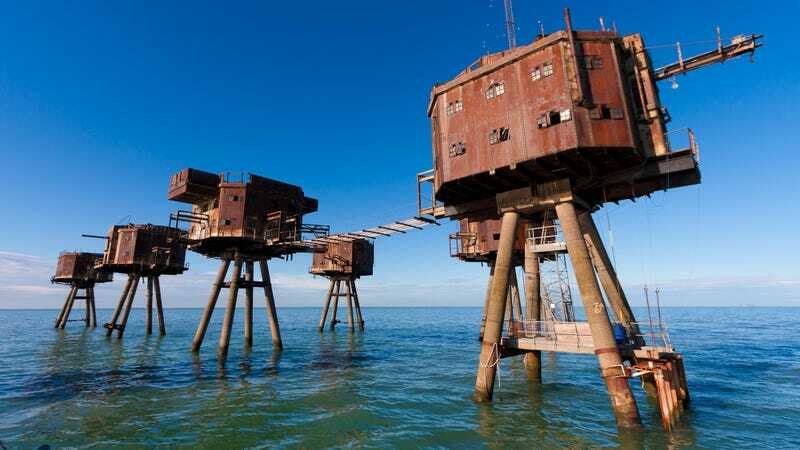 Its twin, the Red Sand Army Fort, is also still standing in the Thames estuary. Ultimately, all the sea forts were decommissioned by the late 1950s, and several were destroyed after collisions with civilian ships, but the Shivering Sands (above), Red Sands, and Fort Roughs (below) remain to this day. Both went on to have adventures after their decomission and abandonment; Shivering Sands was briefly home to pirate radio operators in the mid-1960s, and Fort Roughs is currently home to the Principality of Sealand, the self-proclaimed and globally-unrecognized "world's smallest nation."